Earlier this summer, I spent an embarrassing amount of time online shopping for a Bridesmaid dress. It was quite overwhelming considering how many dresses are out there, I think I ordered 5 before I found the right one! During my search, I stumbled across a few dresses that immediately brought a smile to my face. Not because they were something that would work for a bridesmaid dress, but because they reminded me of a dress I had loved as a little girl. When I was little, I spent a lot of time at my Grandma's house. They had this huge basement my cousins and I used to play in. We'd play dress up and put on plays for the adults. My grandparents pretty much let us run wild down there, which as a kid, was awesome! There was a box of clothes for the girls to play dress up with, and in the box were some of my Mom's old dresses from High School Dances. One, was yellow dress with a lace overlay and ribbon sash. Which, if you know my Mom, you'd know she made it herself. So as you can imagine, while I was browsing online for dresses and came across the three styles below, it brought a huge smile to my face. I immediately emailed the links to my Mom, which she got a kick out of. I vividly remember playing in my Mom's dress, and seeing these modern versions of it brought back so many great memories of playing with my cousins at our Grandparents. It's so fun to see how styles and trends repeat themselves. I've always said I am an old soul, and I love the classic silhouette of these dresses and the modern spin on 1960's fashion. While I may not be sporting overalls and crop tops, I can definitely get on board with classic pieces like this that are coming back into style. And of course I can't post about my Mom's beautiful dress without sharing a picture. 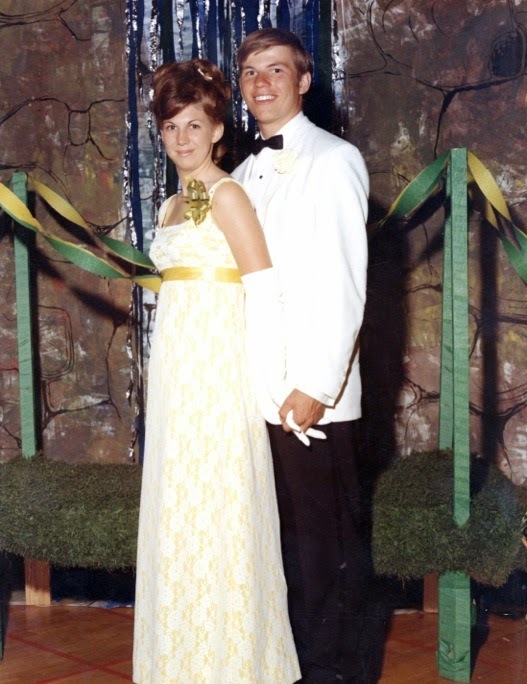 This was my parents Junior Prom in 1968! They got married a few years later in 1972, aren't they so cute!? What are some trends you're excited to see coming back into style? Do you think I look more like my Mom, or my Dad? Your mom is so talented. That dress she made is beautiful! I really like dress 1 and 3 you posted. I think you look a lot like your mom, but from the pictures you've shared of your sister she really looks like her! 1960's dresses are some of my favorites..so fun!